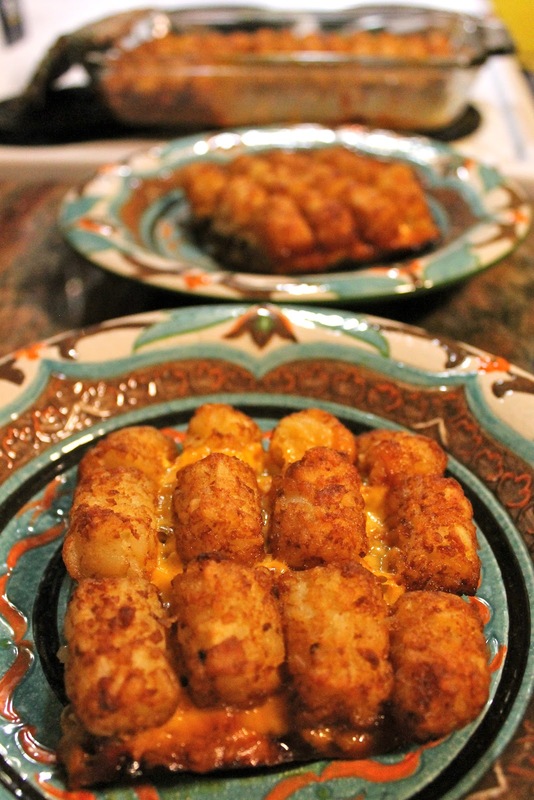 Can a person love tater tots more than me? I don't know...I love them sooooo much. Sooooo. Much. When I learned about the tater tot casserole, I felt like I was being shown the sun for the first time. It was so beautiful! Why did my mother not make this when I was a child?! Now, a lot of the tater tot casseroles included cream of mushroom soup from a can, but as you might know, I don't do canned soup anymore. That was when I got to thinking, and my mind wandered through various points and settled on sloppy joes. 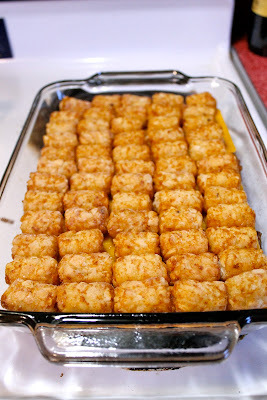 The perfect base for the tater tot casserole would be a sloppy joe base. So that's what we're gonna do. 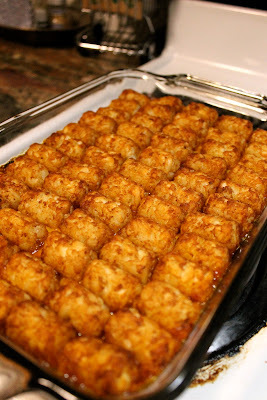 My dear reader, meet the sloppy joe tater tot casserole. It's a thing of beauty. It's like a sloppy joe met a tater tot and proposed marriage. This casserole is their marriage bed....eat your heart out. 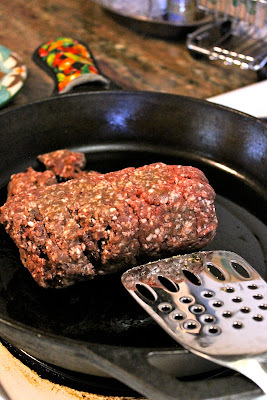 Start with a pound of ground meat. I chose venison, which is not likely to surprise anyone. 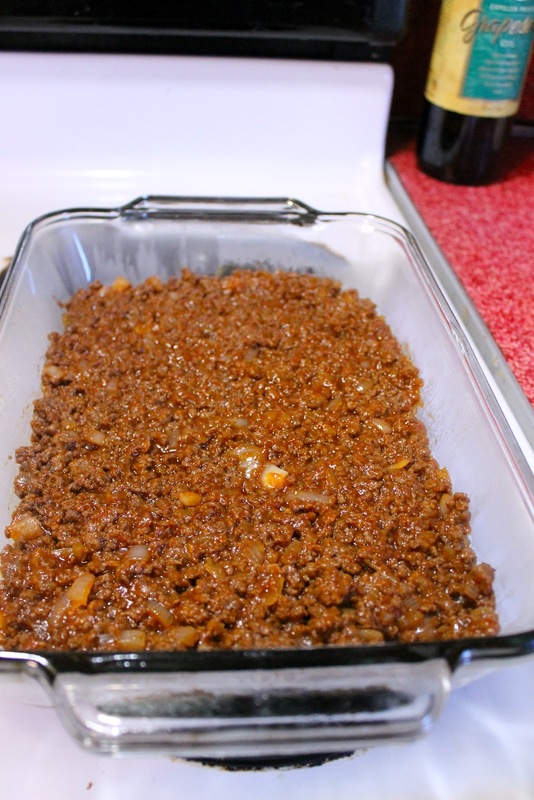 Brown it in your pan while breaking it up gently with a spatula into small crumbles. 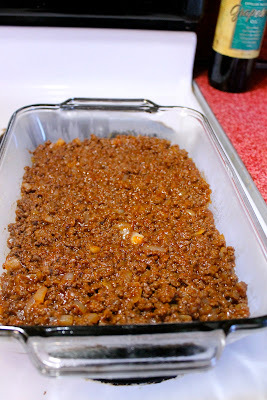 To make our joes all sloppy, we're going to add onions, garlic, tomato paste, brown sugar and a little bit of water, along with a few other things. First add your onions and garlic. Let them cook a few until the onions start to become translucent. Then we're adding all our yummy ingredients to sloppy it up. Worcestershire sauce, brown sugar, tomato paste, a dash of cayenne, some salt and pepper a little water (so it's not too thick). When it's all done, you are gonna put it in an 8 x 11 pan. I already greased my pan with some Pam cooking spray, which, incidentally, I am becoming more addicted to these days. Now, top your sloppy joe mixture with 6 slices of cheddar cheese. 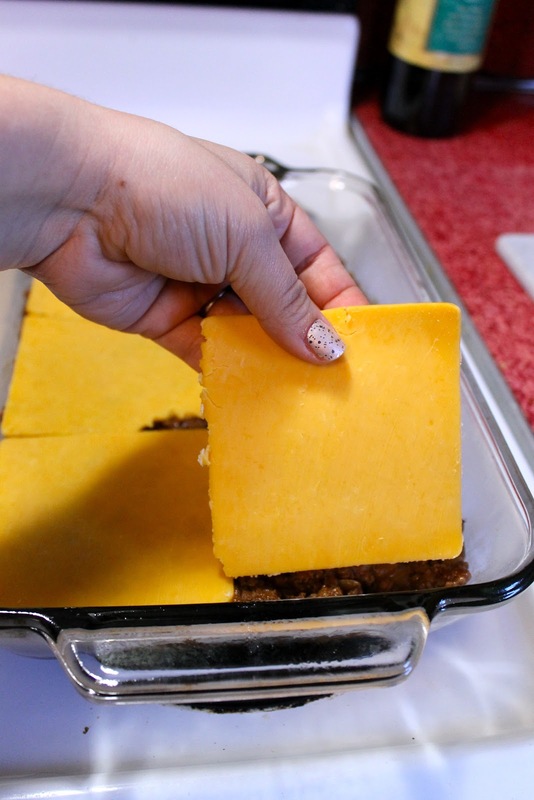 If you don't have cheddar, you can use something else--like Munster or American cheese. Looking into this bag of tots made me really excited. Anyone else? Now, place as many tots as will fit over the top of the cheese. Okay, now we're going to bake this sucker on 375 for 30 minutes. Because I am a fan of extra crispy, I hit it on HI Broil for 5 minutes at the end too. I'm adventuress. Holy mother of tots. This is a thing of beauty. I would love to tell you that we didn't eat this all in one sitting....but that would be a lie. Preheat your oven to 375 degrees. Grease an 8 x 11 casserole dish. In a skillet over medium high heat, add your olive oil and ground meat. Brown your meat for 6-8 minutes, breaking it up into little crumbles as you do. 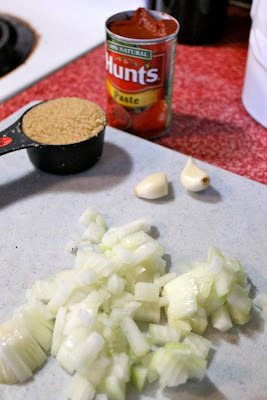 Once browned, add to the meat the onion and garlic, cooking about 2-3 minutes or until the onions are becoming translucent. Add your worcestershire sauce, brown sugar, tomato paste, cayenne, water, salt and pepper. Cook and stir until fully combined. Taste and adjust seasoning if necessary. Put your meat in the greased casserole dish. Place your cheese over the meat. 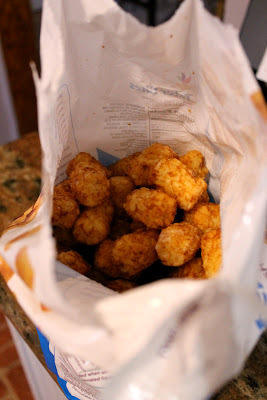 Remove the tots from the freezer and place them in the casserole dish over the cheese. Place the casserole in the oven and allow it to cook (uncovered) for 30 minutes. After the 30 minutes is up, put the oven on high broil and allow them to crisp up for 5 minutes. Serve and watch it disappear!!!! I can picture this on my lunch table :-)) So delicious looking.